Explanation of the purpose of a personal program during Lent and ideas to implement. It isn't enough to slide through Lent just observing the fast and abstinence laws or giving up chocolate. We should all undertake a Lenten program, an inward cleansing and purification, for oneself and the family. The program needs to be planned and organized. Ask the question: What shall I and my family do this year for Lent? Goals and activities should be realistic and reasonable, and parents should make sure that their children know why these practices are being adopted, rather than merely forcing them upon them. After deciding our goals, both individual and family's, we need to arrange our schedules, plan the different events and make adjustments to our life to put these resolutions into practice. Our daily life doesn't stop just because Lent is here. The challenge is to observe the spirit of Lent and perform the works of Lent while living in a secular culture, to remain in the world but not become a product of it. Read Pope Francis's Message for Lent 2019 for inspiration for Lent. This year's theme is "Don’t Let This Season of Grace Pass in Vain." 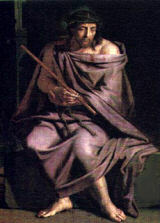 There are three principal works for Lent, as taught to us by Christ: prayer, fasting and mortification, and almsgiving. More categories from Catholic tradition can be added, such as Good Works, Education, and Self-Denial. All are linked to each other. It is through prayer that we know Christ, understand His Will for us. Through our prayers we open ourselves to charity, generosity towards others and self-denial to ourselves. "Prayer is the raising of one's mind and heart to God or the requesting of good things from God" (St. John Damascene). We communicate with God and work on our relationship with God. There are many forms of prayer that we can and should practice, both interior and exterior prayers. Adding extra daily Masses throughout Lent would be ideal. If this is not possible, the readings from the Mass should be read and meditated upon daily. This could be done as a family, perhaps at the dinner meal. The Mass is the prayer of the Church, and the highest form of prayer. It also unites us with the whole Church in public prayer. A strong emphasis should be made in frequent reception of the sacraments of the Eucharist and Penance. We should learn how to daily examine our consciences. Spontaneous short prayers or ejaculations, such as "Jesus, I trust in You." Something for the soul. This should be deeper spiritual reading that gives a program, guidance, and spiritual direction, including writings of the saints like St. Teresa of Avila, St. Thérèse of Lisieux or St. Francis de Sales. Curb forms of entertainment such as TV, dining out, movies. Eat less at meals, or eat fewer snacks between meals. Fast or abstain extra days in Lent besides Ash Wednesday and Good Friday. Make simple meals that are healthy, but less appealing to the sense of taste. In fasting, we are also practicing Self-Denial. This is the area that tests our will-power. We have the opportunity to give up innocent pleasures without complaining: radio, TV, internet, personal time or leisure, secular reading. We can choose one area in Lent and try to persevere throughout the 40 days. This is not just a test of wills—the main intention is purification, and making reparation for the offenses against the Mystical Body of Christ. So even if these actions are done in private or secret, they help us grow in our spiritual life, and benefit the whole Church. In the opening Gospel of Lent on Ash Wednesday, Matthew 6:1-6; 16-18, we are told to pray, fast and give alms. Almsgiving is not a thing of the past, but still a necessity in becoming saints. Almsgiving is also tied closely with fasting. Whatever we give up, the money we save should go to the needy. It should be given away to the missions, the Church or a worthy charity. In a family with small children it helps to make this a visual practice by, for example, having a jar or box in the center of the table as a reminder and measure of progress. It is also considered "almsgiving" to give one's time and goods to those who are in need, i.e., donating time for a soup kitchen, giving clothes to charity, visiting the shut-ins and elderly, driving those without transportation and other similar practices. How can I improve my daily duty? Daily Duty at Work: We should make sure that we don't waste time. We are being paid to be productive, so we should curb spending work time surfing the Internet, answering personal phone calls, and writing personal email. And the work we do should be efficient and our best, not shoddy, hastily completed work. Daily Duty with Family: We can improve the quality of our family life by spending time reading and doing family activities together instead of watching TV and playing video games. If a family dinner isn't a common occurrence, we should schedule a few nights a week for everyone to have dinner together. We then can enjoy being together, talk and share events with each other and maybe read some Lenten reflections while at dinner. And every member in our family deserves to be treated charitably and patiently. We need to make concerted efforts to be cheerful in our home, not just save it for strangers. Our family deserves the best. Daily Duty with Personal Time: At the end of our life at the personal judgment, we will be accountable for every moment of our lives. Is all the time used wisely, or is there room for improvement? Are morning and evening prayers in the routine? Can we spend more personal time for prayer, or discipline ourselves to get enough sleep (in order to be less irritable and more productive)? Many of us postpone or procrastinate personal jobs, prayer and reading for some other time. But NOW is the time to make the best of our daily duty. For families with younger children, there are instructions for a Family Lenten Chart to help keep visible track of progress during Lent.